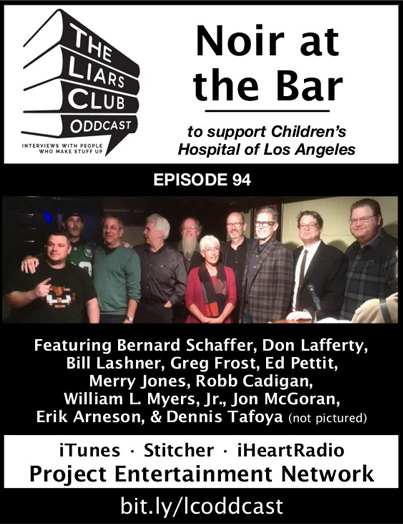 This week’s Liars Club Oddcast is a very special Noir at the Bar, with bite-sized readings from Jon McGoran, Merry Jones, Bill Lashner, Robb Cadigan, Gregory Frost, Don Lafferty, Edward G Pettit, Bernard Schaffer, Erik Arneson, Dennis Tafoya, and William L. Myers Jr. The show is a fundraiser for the Children’s Hospital Los Angeles, in memory of Evie Swierczynski, and the Liars and readers encourage all listeners to consider a donation in Evie’s honor at bit.ly/team-evie-chla-fundraiser. Your tax-deductible gift will help create hope and build healthier futures for many young patients and their families.